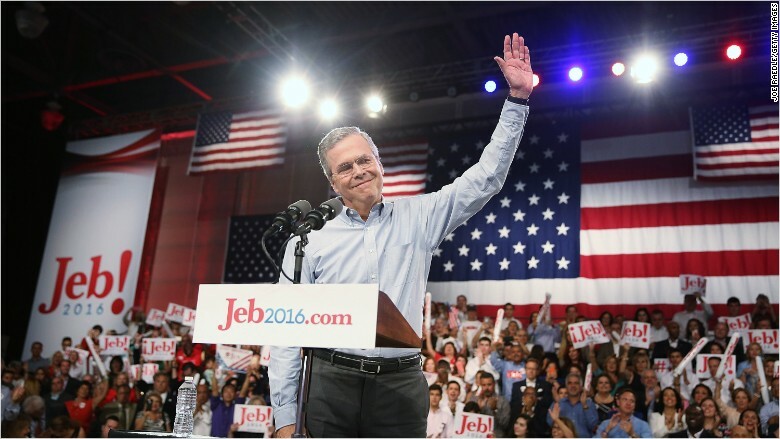 Jeb Bush announced his candidacy for the 2016 presidential election on June 15, 2015. Jeb Bush kicked off his presidential campaign Monday, vowing to make America back into an "economic superpower." He says that the U.S. can achieve 4% economic growth per year under his watch, and that America would gain 19 million jobs. "We made Florida No. 1 in job creation," Jeb Bush touted. His promise: "We will make the United States an economic superpower like no other." America's gross domestic product, the broadest measure of economic activity, was 2.4% in 2014. Since President Obama took office, the economy has added 6.9 million jobs, taking into account the huge job losses during the Great Recession in Obama's first year, according to Labor Department data. Here's a look at Jeb's record as Florida governor from 1999 to January 2007. Florida's economic boom: When Bush left office, Florida's unemployment rate was only 3.4%, well below the national unemployment rate then of 4.4%. Florida's unemployment rate today is 5.6%, according to the Labor Department. Bush championed tax cuts and privatized many government jobs in the state. His tax cuts were widely viewed as a benefit to the wealthy -- they went to businesses and investors. Still, Florida was flush with job growth during his tenure. Florida's economy rode the housing and tourism boom. The state grew 4.4%, on average, during Bush's years, far ahead of the 3% national growth average during the same time, says Sean Snaith, an economist at the University of Central Florida. "It was pretty strong," says Snaith of Florida's economy under Bush. But he notes: "Florida's economy has a history of boom and bust." Then Florida's economy went bust: The question is how much credit Bush and his policies can take for Florida's economic boom. Or, conversely, how much responsibility should he bear for Florida's downturn shortly after he left office. Construction -- a pillar to the state's economy -- grew in part because it was easy for home buyers to obtain lots of loan money that they couldn't pay for later. 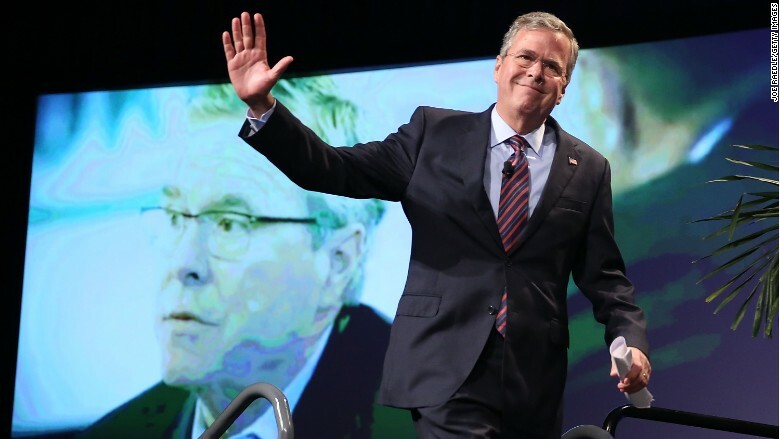 Jeb Bush announces his bid for the 2016 race. Related: Hillary Clinton: Good for stocks? Bush left office -- he couldn't run for a third term -- before Florida's economy collapsed, along with the rest of the American economy. And by some measure, things got worse for Florida than other states. Consider this: the U.S. economy had one month during the recession when unemployment was 10% or higher. Florida had 27 months above 10% unemployment. The recession halted job growth for many of Florida's big businesses: construction, tourism and trade, although all three have seen healthy recoveries during past six years. Bush had been out of office for two years before that downturn began, and it's hard to lay blame on him, says Snaith.